Dear Jimmy, I am writing you this letter to let you know how much I love and miss you. 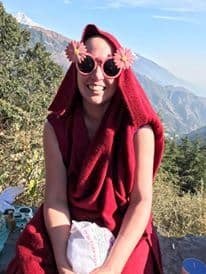 When I moved to Dharamsala, my intention was to focus on studying Tibetan language and Buddhist philosophy, but I soon realised that this was quite a narrow, one-sided approach to living. I began to consider my contribution to a community that provided me with so many opportunities to live a good life. I was privileged to have work, reliable family and friends, good landlords, good teachers―a comfortable existence. I asked myself, what can I do to be more proactive from my side? Jimmy, you had already appeared in my life as a photo of a thin white dog looking for a home. Your name had cropped up in various email discussions. I had followed your sad story and wondered what would happen to you. That’s as far as it went for the first few months. ‘How awful,’ I thought for a few days. And then I forgot about you. But you then you popped in again. I knew that you were looking for a home. I knew that due to health problems, you needed some extra care, long-term. I knew I had to stop asking myself questions of if I could help and actually engage outside of my comfort zone. What was the point otherwise? My place was quiet and it had a sheltered spot in the garden, ideal for someone like you. ‘Let’s commit to doing something worthwhile that doesn’t revolve around my own needs,’ I thought. Jimmy, you were an old dog, but you had a few more years left in you. You needed someone who could commit themselves for the rest of your life. I knew that I was here for at least five years. I put my hand up, and things went from there. I remember the first time I saw you. You were curled up on a mattress, warm as toast. Your tongue was poking out, a little quirk I soon realized was one of your trademarks. You were old but you were gentle. You were so thin that I didn’t need much strength to pick you up and carry you home. Your bed was already set up inside for the night but eventually you let me know that you preferred sleeping in a little Jimmy House outside. So be it. Our first morning together is a remarkable memory for me. It was cold. The sun hadn’t come up yet. I let you out for a toilet walk and afterwards we sat quietly together watching the light slowly greet each bamboo leaf. You were shivering so much and my lap was the most sensible place to sit. It was a lovely warm way to start a life together. Jimmy with her tongue out—her signature. I had class every day and you always howled when you were left behind. There were times when you disappeared altogether because you wanted so much to find me. I was not use to another being needing my company so much. It was an adjustment for me. Sometimes I had to shut you inside the house to keep you from getting lost. Getting lost meant you went without your medication and that wasn’t good. All the same, it must have been terribly boring for you because when I came home. The floor was usually hidden underneath whatever you had found to tear apart. I always needed to make several trips to the bin on those days. Coming home was like walking into my own birthday party every day. Your tail wagged so much your Jimmy House would jump from side to side. I’m sure our neighbours could hear you talking through the trees. The cats inside struggled to be heard when they realised I was home. I did feel guilty that I couldn’t be with all of you at the same time. What I miss about you is your never-ending faith in me. It was instantaneous, and I couldn’t really understand why. I could walk down to the fruit shop and never worry about you leaving my side. Weekends were full of lovely moments of basking in the sun together. You were a great one for hugs. I have always seen myself as a cat person and I didn’t know what it meant to have a dog. I often worried that I wasn’t doing enough to help you with your health problems. It just seemed that problems would appear too often. Even now, I still hope that I did everything you needed me to do for your care. Eventually, you couldn’t bounce back anymore. You became so weak that I had to carry you everywhere. It was one of those periods in life where I had to work out how comfortable I felt projecting my own beliefs onto another. 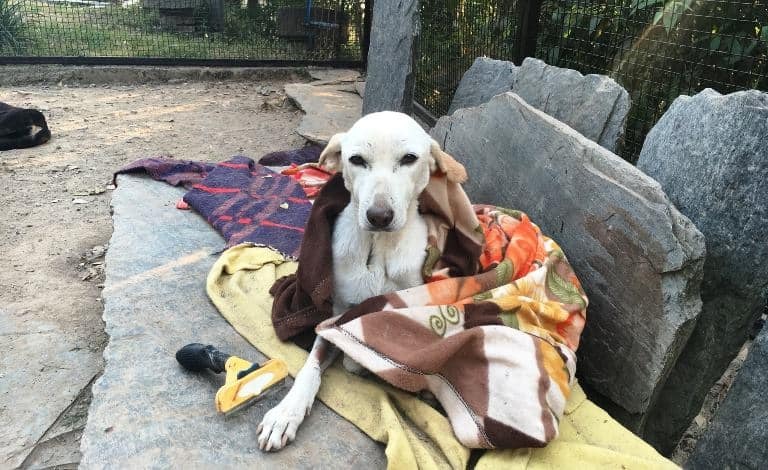 The guys at Dharamsala Animal Rescue knew your journey so well. Although I knew that you wouldn’t be alone with them, it was still a very sad morning when I put you in their care for the last time. Going back home was hard. I couldn’t look out of my kitchen window without expecting your face to appear in your Jimmy House. I even thought I heard you a couple of times, but I knew I was mistaken. There were medicine boxes in the kitchen waiting to be used. The walks to the fruit shop and butchers were quite silent for a while after that. Jimmy, being with you for that time was a really joyful yet confronting experience. You loved and accepted me without question. You were a special being to have in my life. I just hope that you received everything you deserved from me in your twilight. May you be in a place of happiness and endless love right now. Lozang Khadro has been an ordained cat lover in the Tibetan Buddhist tradition for seven years, four of which she has lived in India. Her hobbies include reading, watching The X Files, learning with the purpose of challenging her incorrect assumptions, and asking her cats if they need anything.